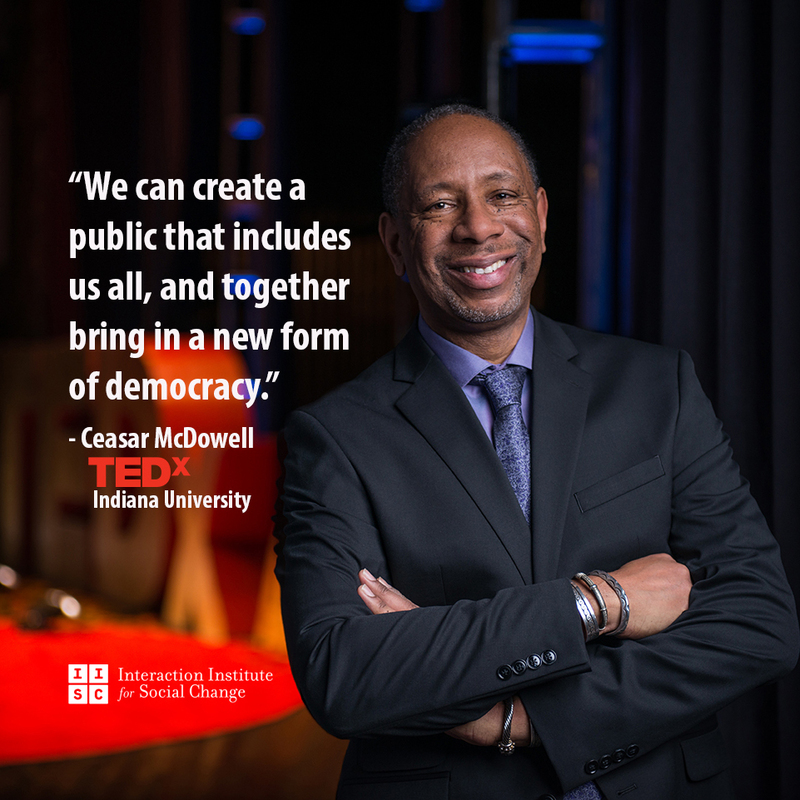 IISC President Ceasar McDowell brought Big Democracy to TEDx Indiana University on November 13, 2015. The talk explores how disconnections in narrative, communications, and design stand in the way of democracy and what today’s global social movements are doing to repair these connections. McDowell articulates that we are in a new era called Big Democracy, one which can hold the diversity and complexity of people in the world. The talk closed a powerful evening of speakers around the theme “Eyes on the Stars, Feet on the Ground.” Thanks to everyone at TEDx Indiana University for the invitation to speak and for an incredibly well-produced event. Gezi Park, Arab Spring, Occupy, Black Lives Matter, Dreamers. All over the world, people are coming together and saying enough and demanding change. Enough of inequality, enough of violence to women, enough to destroying the planet. Enough to violence and conflict and war, religious intolerance. Enough to someone working 40, 50, 60 hours a week and still not having enough money to clothe, feed, and shelter themselves or their family. Enough. These protests that are happening they’re actually challenging power, they’re calling in question the status quo. And for some of you this may be difficult to accept. Still for others you may look at them and say what are they doing? They’re disrupting the order of things. They’re causing divisions where we don’t need divisions. They’re undermining our civic life. And still for others you may look at them and say, I don’t know, I wonder what’s going on. I wonder if they’re important, if I should join, if they have meaning, if they are real. Regardless of where you stand, these protests are growing. Tens of thousand people showing up in the streets of Hong Kong actually asking for electoral reform. Over 400,000 in the streets of New York for the People’s Climate March. And over 2 million Brazilians in the streets saying we want to end corruption in our politics. They are saying enough. But not only are there lots of people coming together, what’s happening in these efforts is they’re creating opportunities for people from all walks of life to come together. They are doing something that we thought was impossible; that given our diversity and the complexity of who we are that we can actually begin to work together and to create a public that includes us all. How did they get there? I want to introduce you to Tachi Kiuchi. So Tachi in 1993 was the chairman and the CEO of Mitsubishi Corporation. In that same year he found himself the target of a direct action from the Rainforest Action Network or RAN. This was a surprise to him because Mitsubishi Electric actually had not stock in timber, they didn’t do anything that bothered the rainforest. However, Mitsubishi Corporation, a totally different company, owned 3% of the world’s timber. Now at this point Tachi could have said, well, it’s not my problem, they’re not after me really. He could call them up, give them the number of Mitsubishi Corporation and be done with it. But instead what he did is he got in a plane, he want to Malaysia, and he sat down and spent time with the people from the Rainforest Action Network. He wanted to understand why they thought this was such an important issue. He later wrote a book about this called What the Rainforest Taught Me. And he used the lessons in that book to actually shift the culture of Mitsubishi Electric and many corporations in this world to be about collaboration and learning. 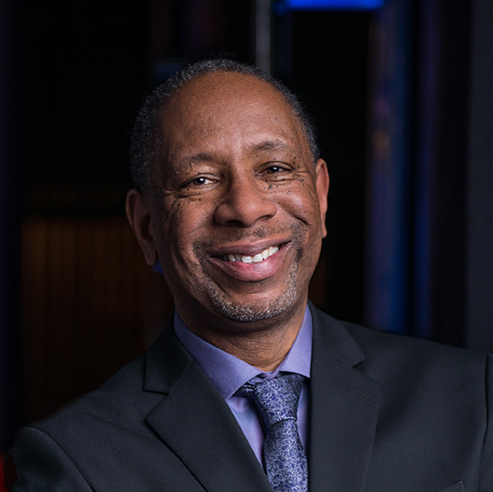 In the book he lays out a number of things that happen in nature, this kind of ecology that we talk about right now that are important to us to mimic in the human systems we build if we want to build healthy systems. Chief among those is this, in nature nothing exists alone. It is, eh says, the power of connectedness. As human beings, as part of nature, like the rainforest we need connectedness in order to thrive. This is in some sense the brilliance of these new movements because what they are doing is saying they’re looking at the disconnections that had basically invaded all of our lives, and they’re starting to build new forms of connection, new forms that allow us to see each other connected together. And through this they are creating the possibility that we might actually create a new form of democracy, one that includes us all. One that I like to refer to as Big Democracy. One of those disconnections that are out there and are in the way of Big Democracy are these disconnected narratives we tell ourselves, these narratives about who belongs and who doesn’t. There are lots of people in this country who were born in this country, who went to school in this country, lots of young people in this state whose parents weren’t U.S. citizens. And because of the disconnected narrative we tell about them, they are cut off from opportunities. We call them illegal. But a group of these young people actually got together and organized themselves differently to change that narrative from one of disconnection to connection, and they call themselves undocumented. In the midst of doing that they basically were saying many things. One, that migration is beautiful. Two, that they weren’t illegal, the problem was the bureaucracy, the system that didn’t know how to recognize them. And because of this reframing they have actually created the opportunity in many states to actually take on this issue and start to create these new paths for them to be engaged. Another of these narratives of disconnection that are out that affect our ability to come together affects me very personally. And that is the one that says by virtue of me being a black man, I somehow am a threat. And Black Lives Matter did something really beautiful. It actually reframed that into a conversation of connection. The notion of Black Lives Matter was to say, no, the reality of black lives is that they’re not about threat, they’re about the fact that people of all races actually matter, and particularly black people matter. And this has ignited a debate and a conversation in this country around race like we’ve never had before. But these narratives of disconnection don’t just affect people of color. In 2008, when we were faced with the largest housing mortgage crisis in this country, millions of people lost their homes and all the wealth that they had, the narrative of disconnection that was told then is that the problem was there were too many people who were actually given loans who couldn’t afford them, shouldn’t have had them in the first place, and that’s why the market collapsed. When Occupy identified the 1% they shifted that, and they basically said those people who lost their homes were actually part of the 99% of this world who are living in the conditions that they are because of the extraordinary wealth that the 1% hold and what they control. There’s also another disconnection that happens. This is a disconnection around communication, meaning the disconnections about who actually needs information or has information. So in 1931, in Tennessee, young Miles Horton started something called the Highlander Folk School. He started it as an opportunity for coal mining families to actually come together and learn from each other, talk to each other so they can actually share the conditions and start to figure out how to come to local solutions for their problems. Over the years it became a center for activity of organizing in the south, one of the few places where blacks and whites and labor unionists could come together. In 1961, Miles was arrested and Highlander was closed down temporarily. His crime? Going to one part of the state, getting information, and bringing it to another part of the state. Now it’s kind of hard to imagine in this day and age that someone could be arrested for that. With Facebook and Twitter, with the free flow of information, how could that happen? I guess actually Snowden and Assange could tell you how that could happen. The reality here, and these kinds of disconnections of communication, is that what was happening at Highlander was something very unique, because they had a dual strategy. Not only were they doing this work by sharing information but they were actually creating a physical environment for people to come together, people of all kinds to come together, and do something that my friend Karl Moore calls “to struggle with the conditions that bind them and the interests that separate them so that they can create a future that’s an improvement on the past”. In today’s language, Highlander in 1933 created both a digital and an analog strategy. A digital for sharing information and an analog for people coming together. These new movements today recognize that and that’s exactly what they are doing. They are seeing the interconnection of bringing those together. So Black Lives Matter, for example, started in a hashtag and spread virally. But soon it found itself on the ground in communities across the U.S. Now for most of you the only thing you saw in those communities may have been riots and protests and other types of things happening on the TV. But the majority of the work that was going on with communities was actually people sitting down in churches and classrooms and living rooms and try to figure out how we’re going to come together and actually learn and heal together so we can begin to live as if we believe and know that Black Lives actually do matter. The last narrative, I should say the last disconnection that these movements are dealing with is what I call the disconnection of design. And that disconnection is about saying who actually has something to offer. Now design is everywhere, everything around us is designed. This stage, this auditorium fills 4,000 people and its sole design purpose is to have you focus on me. That’s how it’s structured. But there are other consequences of this design. So, for example, if you happen to be about six feet tall you’re probably hoping I’ll start talking so you can get your knees out of the front of the chair in front of you, right? Or if you happen to be, you know 4’5” or under you can’t wait to put your feet back on the ground. Those are the flaws in these designs because what we tend to do in this world is design for the middle and forget about the margins. What these new movements are saying to us is that it’s actually in the margins that we have to concentrate our design. And this feels a little counterintuitive, right, is that if you actually pay attention to the margin and design for them you actually cover the middle. It’s like a tent, right? If you take a tent and you stake it far out at the margins, well guess what, the middle is always covered. And the further out you stake it the stronger the structure you get. And why is that? Because in our systems and our social systems the people at the margins are actually living with the failures of the systems. And they are creating adaptive solutions to them. So when we design to take care of them we build stronger systems for everyone. I love this picture. I don’t know if you can see it, I can see it. That one right there, all right? 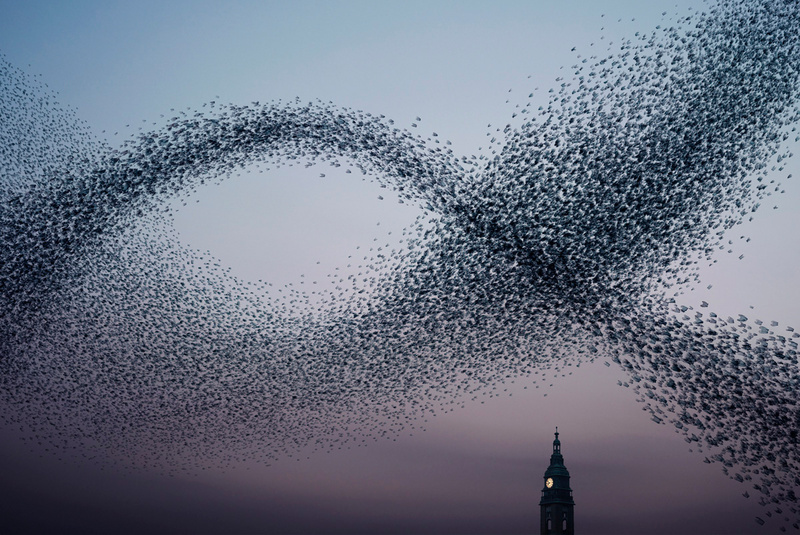 I don’t know how many of you have ever seen the starlings fly like this? It’s an amazing thing when you actually experience this, you see these birds fly through the sky like that. But there’s something really interesting about it we started to learn. We used to think that actually they’re like a flock and they’re flying following a leader and the leader keeps shifting. But in actuality what’s happening is that each individual bird is just paying attention to what’s around it, and it’s connecting on a physical level to everything that is immediately around it. And by doing that they create a chain that actually can work together. It is a connectedness in how they move about in the world that is framed by being and paying attention to what’s around you. In this day and age what’s around us is a lot of things we don’t know and understand, different kinds of people, different kinds of situations. And it may be a little hard for us to say how do I connect to that thing that’s immediately around me? But if we don’t, we actually won’t be able to move forward collectively in a way that allows us to construct a different kind of democracy in this world. So I have a little tool for you, a little thing that I call Micro Inclusions. Now, I’m sure all of you have heard of microaggressions, those little things that people can do that actually they’re really aggressive but they’re just like really small. Like as you walk behind them, and they close the door really slightly, you know. Other little things that they do they’re just mean but, you know, small. And they have a lot of power on the person that it happens to. Well, I think we can do exactly the same thing with inclusion. Little steps, little things you can do in your day-to-day that says to the people who are around you, “you’re included, I understand that you’re there.” Those are the things we need to start doing so that as a nation, as a people, we can actually be able to fill and create a mass of people who can actually bring in a new form of democracy. Because if we do that, this generation, this planet, ultimately all that we are will be better. But we can’t get there without you. So my request to you is when you step out of here tonight, see can you create a micro inclusion before you get to the street?